leaving the beds for a bit, just cause i want to get the woodworking done while i have no kids at home, and since christmas is coming, i’m going to tackle another project that has been on my list for ages…. a fireplace. 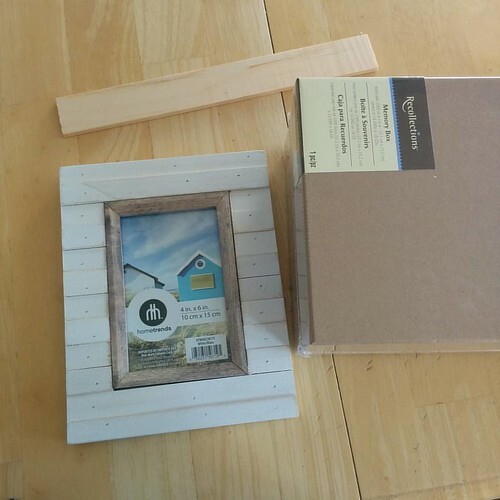 i’m starting with a photo box using the lid only) a picture frame and a vague idea in my head of where i’m going…. 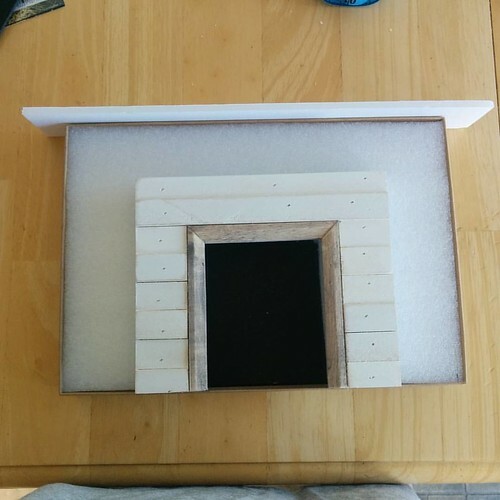 i cut the frame down to make the front of the fire place. for the back i turned the lid over – it already was black inside which is a bonus since i may be able to leave that as is – then filled it in with a piece of packing foam. this is the same foam i used for my couch ages ago. i still have a bunch of it left over. it wasn’t quite deep enough so i put scrap pieces foam board on the back. i could have put the foam core on top but it wasn’t cutting as smoothly on the edges. i’ve always wanted to try doing egg carton bricks and this seemed to be the perfect place for them. unfortunately my first calculations were off and the 1/2″ x 1″ bricks i cut were just slightly too small. i ended up with either too much gapping or uneven rows and and asymmetrical pattern. so i recut them all at 1-1/8″ X 5/16″. that worked out perfectly and i got hem all cut out and glued down. however cutting two sets of bricks took all my time, and i’m out at drs again tomorrow so this gets put on hold for a couple of days most likely. It’s looking great. You are doing a great job of the painting. 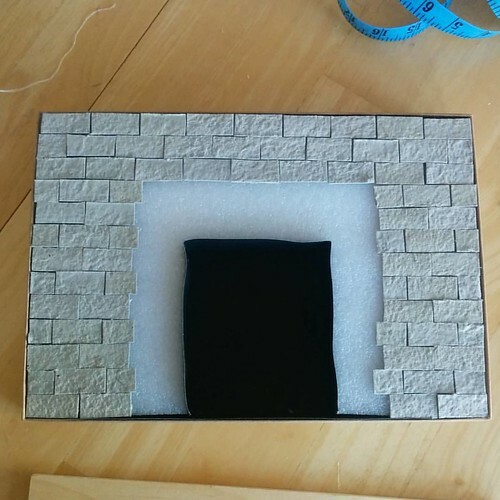 I had almost chosen to do egg carton bricks myself but the combination of a serious shortage of paper egg cartons and stumbling across a MyFroggyStuff video on faux river rock and my project took off in a different direction.